This week, I achieved my lifelong childhood dream of becoming an android. When I was younger, I looked up to Data from Star Trek: The Next Generation. I related to the way he was confused about the world because I was too. As he learned about humanity, so did I—he helped me understand what on earth this whole life thing was about. Naturally, he was one of my childhood heroes. Because I looked up to Data so much, I, of course, wanted to be like him. There were multiple ways I wanted to be like him—and many ways I felt I already was. However, one way in particular I wanted to be like him was how he wasn’t confined to such human inconveniences such as eating and sleeping, which left him a lot of time to do what he want to do. As a kid, I found that idea so enthralling. While I love food and sleep, sometimes they get in the way of reading books or writing stories or hanging out with people. 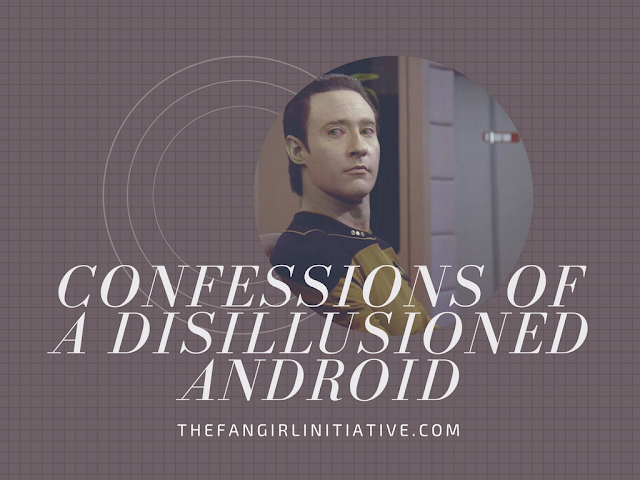 And although I know sleeping and eating is the healthy thing to do, sometimes I get so distracted that I forget that I’m a human and need to take care of myself… thus, the perfectly rational desire to be an android so that I could just forego it altogether. I have insomnia, so I’ve already got the not-sleeping thing down. However, I’ve still needed to eat (because it’s pretty necessary to live). Most of the time I do a pretty good job at it. However, this week I had a colonoscopy and upper endoscopy, which meant I had to fast for two and a half days. And so it was that this week, I became my childhood hero, Data. It was... terrible. Never become your heroes—it will only disappoint you in the end. Because my productivity wasn’t improved; I was just miserable. And once I wasn’t allowed to eat, all I wanted was a giant cheeseburger. Lesson learned #1: being an android is overrated. I think I’ll stick to being a human from now on. Lesson learned #2: I thought otherwise, but Data wasn’t done teaching me things. Thank you, my wonderful, quirky, robotic friend.